Whale and Marinelife Whale art including original acrylic paintings by marine life artist Chris Harman. Orcas ( killer whales ), sperm whales, humpback whales, dolphins and blue whales are just a few of his ocean life subjects. His love for painting marine life has become his most recent focus. Chris Harman has a love for wildlife and marine life. His whale paintings show his love for depth and detail as viewed in the sample original painting within this web site. Chris paints a diversity of whales ranging from orcas to sperm whales. All the following whale art paintings are available as fine art whale prints. 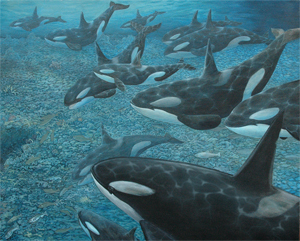 Like Peas in a Pod is one of a series of marine life paintings depicting Orcas or Killer whales done on 2'x4' masonite panels. I painted this whale painting on masonite because of the smooth surface so I could try a different type of wash technique to give the appearance of real underwater depth. Click button below to buy Marine Life Prints. Scarred Giant is one of a series of marine life paintings depicting Sperm whales done on 2'x4' masonite panels. I painted this whale painting on masonite because of the smooth surface so I could try a different type of wash technique to give the appearance of real underwater depth. Click button below to buy Marine Life Prints. Orcas and Salmon - featured by the BBC Wildlife Magazine. The December 2007 Volume 25 Number 13, the BBC Wildlife Magazine featured "Orcas and Salmon" by Chris Harman. 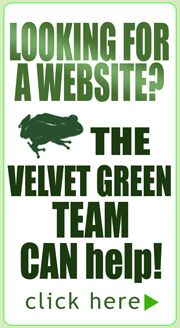 Quote: "Executed with great effectiveness. Orcas and Salmon is another example of the range of artwork available in this genre. This wonderful acrylic whale painting of orcas demonstrated the movement, colour and beauty of nature." - Pip McGarry. Pip McGarry is a professional artist and Chairman of Marwell International Wildlife Art Society (MIWAS). The article was entitled "Paint fish and other marine wildlife" written by Pip McGarry. 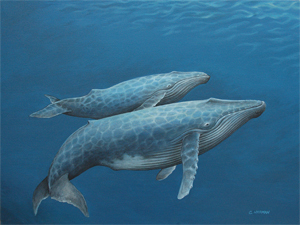 This painting of a Humback Whale mother and calf was done as a study painting for a large scale mural to be painted by the artist Chris Harman as a personal project for a room he calls the "Whale Room". This is one of many studies the artist has done in small scale on canvas for whale paintings.